The Crab Trap was again the venue for the FELS Spring Luncheon on May 4, 2016. Beverly Rubin, FELS President, graciously introduced the new board of FELStockton. 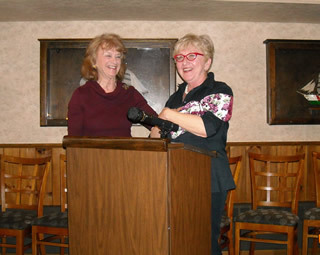 Standing from Left to Right: Peg Fiore of Stockton Foundation ; Adele Cohen of FELS. Seated Left to Right: Sandy Leone of Stockton Foundation; Bev Ruben of FELS and Esther Steele of FELS. Esther Steele (L) and Beverly Rubin (r).